An Electronic Medical Record (EMR) is the new way that all hospitals – including Kohala Hospital and all HHSC facilities, are required to keep patient records. The EMR system keeps track of a patient’s entire health and medical history in a computerized electronic format. This federally-mandated change helps HHSC hospitals, physicians, insurance companies, and other health providers to retrieve information much more easily than ever before, as well as make a patient’s stay or transfer much safer and more efficient. All patient files, including history, diagnosis, medications, and other important information will be kept electronically and safely stored. 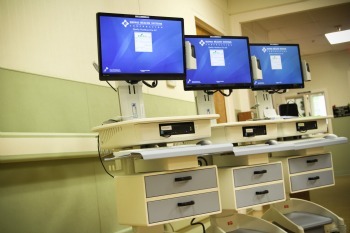 In May 2010, the HHSC East Hawaii region started its switch to EMR, which will replace paper patient charts. In September 2011, the West Hawaii region and all other HHSC regions collectively began to plan this exciting, once-in-a-lifetime project to transform how care is managed within the family of their facilities. The project involves bringing technology to HHSC in a manner that will drive excellence and automation in all of our operations. On February 1, 2013, the West Hawaii Region, including Kohala Hospital went “live” with Electronic Medical Records and began a new era in quality healthcare.